That carpet may have to go. It looks old and worn even if it has been steam-cleaned a hundred times. It’s time for a change. Who knows, you may have the perfect wood for your home interiors just beneath your carpets. It may be worth a peek. And it gives you a chance for change if you’re in a home improvement mood. Here are the top five trends in hardwood flooring this year that could fetch you a better price on a resale. 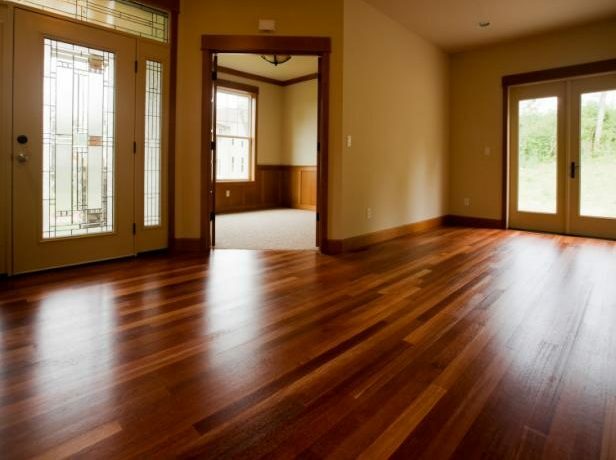 Traditionally the planks in wood flooring were cut from 2 1/4 inches up to 3 1/2 inches wide. Now they range in width from two inches all the way up to seven inches. Wider planks tend to open up a room and make it feel more spacious, which makes for an excellent upgrade for the living room or master bedroom. A recent trend in color scheme, which started on the West Coast, has replaced warm shades of beige and tan with cooler shades of gray. It has become an amazing “neutral” tone for walls and carpets in order to lighten up a room and create a sense of space. Now the color gray has become a top pick in the wood floor arena. There are various shades of gray to choose from, and the trend will likely continue in the near future. The opposite side of the gray colors and dark tones that are trending is the look of lime-washed wood. This trend was started in the high-end homes of Europe. The mixture of lime and water of a bygone era gives the wood a nostalgic coastal feel. The tone is salt water- beaten and sun-bleached — perfect for brightening dark rooms. Wire-brushed wood is hardwood that has had the soft top layer of wood scraped off, exposing the harder wood and showing more of the natural grain. This may not seem like something that most people want, but the look can also help hide pet scratches and those that come from moving furniture. It has been seen to pop up more in coastal areas as the wire brush tends to leave a more sand-worn feel. Green enthusiasts are flocking to this wood flooring trend. Reclaimed wood is wood used from other homes or projects, or even recycled wood, to create new flooring. The term reclaimed wood refers to all of the different varieties of wood being used to transform it into a new product. Recycled wood refers to wood that has been taken from farms, wood barrels and logs found along bodies of water and used as is.